Another Shoes and Bag Sale at SM Megamall this Nov 21-24! Since I began regularly writing posts here in my blog (I started April this year), I think this is already the fourth Shoes and Bags Sale event that SM Megamall organized for shoe and bag lovers this year. Amazing right? Although sad to say, I do not plan on buying new items for now for the reason that my money is already allocated to my out of town trip next week. 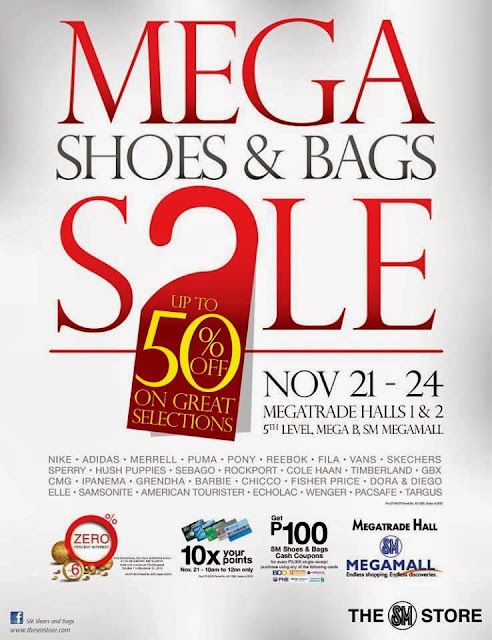 So to those that have the budget and are still planning on buying new pair of shoes or a bag, don't forget to drop by SM Megamall and check the sale at Megatrade Hall 5th Level. The first two hours tomorrow (November 21, 10:00am-12:00nn) will allow you to multiply your points by 10 if you have an SM Advantage, SM Prestige, or BDO Rewards Card. Hope you can share with me if ever you had some great finds from the sale. Happy shopping!